When we look at the total individual contributions to political committees by state, it is apparent that California, New York, and Texas take the lead. 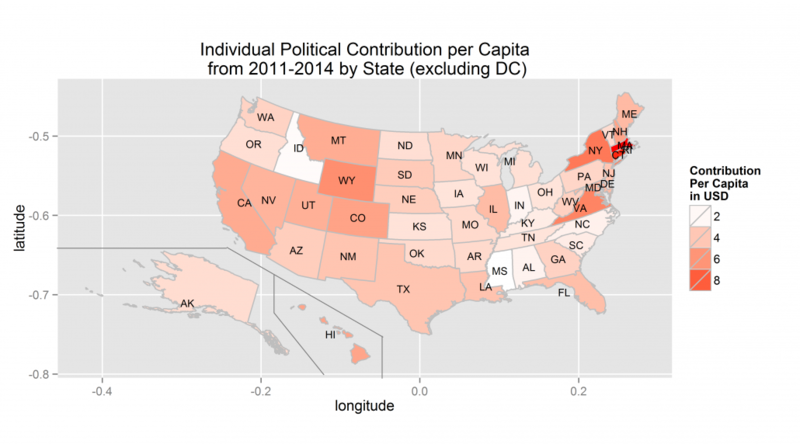 Given the fact that these states have the highest population, can we justify a claim that the residents are more generous when it comes to political contributions? In contrast, the contribution per capita tells a different story. 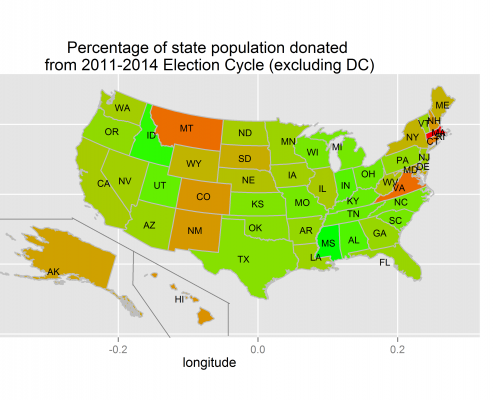 After this adjustment for population by state, Massachusetts and Connecticut lead for political generosity. Meanwhile Idaho and Mississippi consistently collect less total contributions and less per person. Other relatively generous states are New York, Virginia, Wyoming, California, and Colorado. Can we measure political activism by analyzing the individual contribution data? When we look at the number of donors that make up the total population by state, surprisingly Montana seems to have a high number of political donors. Find this interesting? Read another article on campaign finance data! A look into Major League Baseball: Does the shift work? Jasmine Wilkerson is a versatile Data Scientist with strong technical skills and business acumen. She holds a master's degree in Statistics from Texas A&M University.